Don't Forget to Buy a Sure Clamp! SureTrac Systems Sure Clamp is Your Solution! If your tired of smashing your knuckles with those dreaded ski bars, or getting tangled up in several tie-down straps trying to secure your ATV. Sure Clamp is Your Solution! For those of you with Drive-Thru trailers, see our Quick Release Sure Clamp. 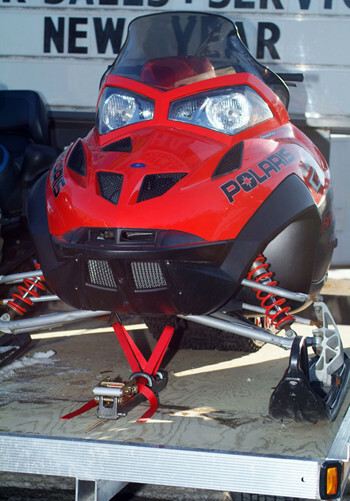 SureClamp quickly secures your ATV or snowmobile to your trailer. Easy release for quick loading and unloading. Permanent mount or Quick Release Models are available. Quick Release Models are designed for Drive-thru trailers or Specialized applications. Both models are easily installed onto most trailers utilizing the existing mounting stock clamp holes. Once in place you can tie down your Snowmobile/ATV’s in seconds. This system utilizes an extra heavy-duty ratchet and strap with rubber coated hooks, that are placed over the Front Suspension, thus causing no harm to your machine. When used properly, Sure Clamp does not loosen up, unlike conventional Ski Clamps. All it takes is a flip of a lever and Sure Clamp releases.